NOTE: RV's, 5th Wheels and large campers must use Gate 4 (Commercial Vehicles). Other gates have barriers that can not be navigated by large vehicles. Gate 4 is about 1/2 mile south of the main gate. This gate is open until 10PM. ---- From I-75 take exit 146 on to GA-247C (Watson Blvd). Continue east about nine miles to the intersection of Watson Blvd and US129/GA247 turn right and continue south on US129/GA 247 for about 1/2 mile to Gate 4 (Commercial Vehicles) turn left and enter base. Continue east to Tenth St and turn left. Continue to signal and turn right on Macon St. Continue to twelfth St and turn left. Continue on twelfth to fork in road and bear right you will pass Turner housing on right. Continue on to top of hill where you will turn left. Scout Lake will be on your right. There is a sign at this turn that says FAM CAMP and an arrow pointing left. Continue on passing the Lodge on your right then bear left and follow the road with Lake Luna being on your right. Continue to FAM CAMP office on the left. They are accepting reservations for 7 spaces up to 90 days in advance. All others are first come. None at the campground. WiFi is available at the base library and at the Air Museum cafe. Must be under control and on 6 foot leash at all times. Must clean up after pet. 6 month stay limit, then out for 14 days. While "not" big rig friendly, 40' motor homes can fit in with care. 10% discount with USAF Club card. Can eat in the dining hall Thursday for dinner for Retiree night. Also on holidays. Breakfast on weekends. Must check firearms in to security. 2016 Brochure on Robins AFB Outdoor Recreation, including rental price list. Robins AFB is a nice base and a good stop over. We had made a reservation, called the camp directly and spoke with nice man. The rate was $25.00 per night. Our site was some what level. We arrived late and the office was closed. “LATE ARRIVALS, your packet of info in pinned on the bulletin board in a plastic sleeve” I missed seeing the packet, did not see our name on it, until the next day when the Camp host took it off the board. I was looking for a box with late arrival information. There is a commissary, base exchange along with a gas station. The camp ground is very, very old and in need of major over haul. There are long term folks here. We had site 18 which the water/sewer are shared by the next rv. The water spigot was so dated, it looked like an 1950 galvanized pipe with a pump handle. We had zero water pressure going into the coach and had to fill up our water tank and turn on our water pump to to take showers, do laundry or dishes. The laundry facility only has one washer and one dryer for the entire park. The bath house is old and also in need of updating. We did not use it. The park is pretty and spring has just started. When we are at Mayport Naval AS all we had to do is call the camp host if there was an issue FLOUR would come out right away and see what they could do. The camp host said it could take a month or year to get something fixed. This is unacceptable. The road into the FAM Camp is very narrow and some area dangerous with large pot holes. The email you receive confirming your reservation explains there are tight turns and large slopes.go slow. The reservation process was very easy. Left message and was called back that day. Host was very informative and welcoming. He called early on the scheduled day of arrival to confirm and provided detailed directions and information about the commercial gate. When we arrived a packet was on the board outside the office with more information. Site was level with full hookups and provided a view of the lake. Quiet for an Air Force Base. Great value at $20. Would stay here again and would recommend. T.M. left this review using the Directory software: - The campground hostess was exceptionally friendly and helpful. She keeps the restrooms by her office spotless. 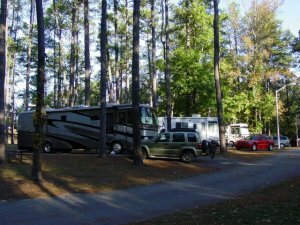 The campground was clean and well maintained, especially considering that the base policy continues to allow Mobile Home stays (ie. long term). A small number of sites are allocated for short term occupancy. However, one can return after only a 1 day absence. Bottom line, only 1 site was available for us the one night we stopped. Best to call ahead. Note: camphost is only a part time position, so a good time to call is from 1000 to 1400 hours. We did a drive-through while we were in the area. Couldn't stay because they were booked solid. When we drove through we could not tell if there were any spots left for temporary stays. They all looked like long term. Nothing was labeled. It's a real shame as the setting is beautiful under the trees by the lake. Did a drive thru while in Perry, Ga. and a large % of RV's look like they have been here a very long time. The grounds looked messy but had to remind myself we had a severe line of thunderstorms that went through the day before so downed branches and stuff lying around was probably from that. Road going into campground has what appears to be a start of a sinkhole as we did not remember the crater in the road from last year when we drove through. There was as FEMA trailer in the park not being used so not sure what that is for. The exchange and commissary are both new in the past couple of years so always shop there when in the area. The fuel prices on base are equal to outside the base and that is hard to find anymore. The price they charge is fair and surprised it has remained at this rate. This FamCamp could be so much more. Unfortunately, as you approach the camp it appears as a clutter of randomly-placed, tightly-packed, homesteaders, which is exactly what it is. I was told that only 7 sites are reserved for people passing trhough or staying a short time. The remainder of the sites are occupied by people, who in some cases, have been there for years. Six smaller trailers were squeezed in between the sites and were splitting FHU's. Even the smaller trailers were homesteading. The base has allowed the FamCamp to turn into a trailer court -- it is very disheartening. We arrived later than expected due to construction on the freeway. We had a little problem finding Gate 4 and once we found it, security was not sure of the directions to the FAMCAMP. After trial and error we found it and was greeted by Lori...she pointed out our site. Once we got hooked up we met our neighbors. It was a little tight but we were happy to get the last site. The golf course was magnificent and were able to play 18 in less than 3hrs. C.W. 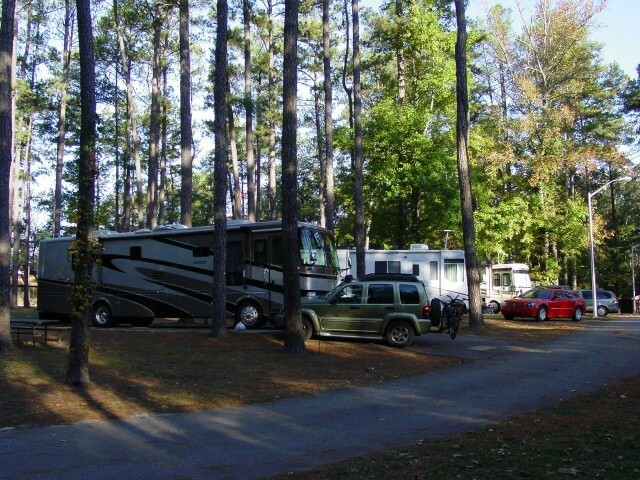 left this review using the Directory software: - Nothing has changed at this campground. Lori is still the camp host and very helpful. Lots of piggy-backing going on and they plan to pour cement on these piggy-back sites. Active duty and inactive reserve can "live" there even if they're PCS. No propane on base. This is a very nice campsite for the $$. Our site allowed us a view of the lake, but other trailers, who were long term were parked on the grass in front of us & piggybacked on the water & electric. Lori, the camp host, was very friendly & helpful. All the base amenities were close & we really enjoyed the fitness center. We stayed here & drove our car to Calloway Gardens, Atlanta & Stone Mt. There is plenty of shopping close by. We didn't use the laundry or bath house. Retiree's can eat at the dining hall on Thurs. One of the best money values we have experienced, $12 for FHU. Lot of very tall pine trees and a few dead ones that were a little concerning in windy conditions. We did enjoy our stay here, good walking and close to Exchange/Commissary facilities (a mile or so). It did appear there were A Lot of Homesteaders which seemed to be active duty and my next door neighbor had been there for over a year. Had the appearance of a Base Trailer Park, but I did get a sight so who am I to complain. Some of the long termers were "piggy backed" from regular sites and were parked off in the grass nearby. The camphost/desk clerk, Lori was friendly and helpful. Bathrooms could have been cleaned a little more often, maybe once during our stay, but there was plenty of hot water and washer/dryer is available. Again, great value and we would stay again. J.W. left this review using the Directory software: Great site for overnight or longer stay to visit area. Super pull through site. Directions to campground were excellent. Must enter and exit the Commercial gate 4. Very pleasant park located next to a lake in tall Georgia pines; some nicely paved sites and some grass sites. The bathhouse/laundry room is nice and clean, one washer and one dryer; can be pretty steamy in the hot summer weather. The host, Lori, is very friendly and works hard to make the park nice. Office hours are only 10 to 2 Monday thru Friday, but they do take reservations if you call early enough to get them. Lori posts clear site information on the bulletin board by the office when she's not there. The FamCamp is very near the nice Commissary and BX and the Air Museum. 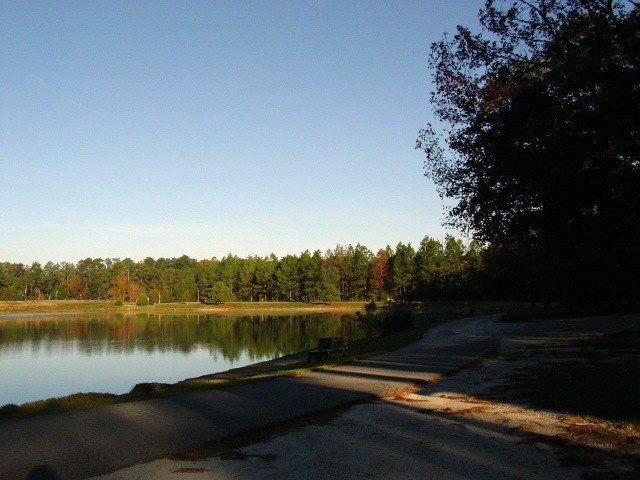 There are several nice lakes on Base and walking/hiking/biking trails are abundant. 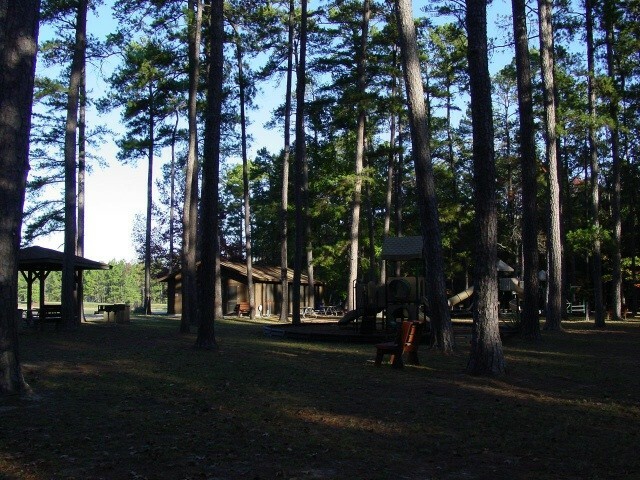 There is a nature trail and nice playground in the FamCamp. We enjoyed our stay very much and will definitely return. Only real drawback is the lovely trees make it very difficult to get TV reception. Do follow the directions on the web site and be prepared for a 20-minute wait for Security to open the commercial gate if you arrive on a weekend. The Phone # is posted on the gate. We spent one night there on our way North. What a pleasure. Wish we had had time to stay longer. The camp host was very friendly and helpful. Everything was clean clean clean. Nice intimate little RV park. Will definitely go back. We enjoyed our stay here. We were only going to stop for 1 night, but decided to stay a second night. Although small, we were able to get a site the same day. Lori, the office staff is very helpful and friendly. With a 6-month stay limit, there were some long-term campers. The biggest plus is the pricing. This is the proper rate to charge for a military benefit. ALL military campgrounds should follow their lead on pricing. (They have a little space for overflow with no h/ups and they have NO DUMP station.) The above statement is true that there is no dump station at the FAM Camp but there is a dump station on the south end of the base on Marchbanks Dr. It is at the entrance to the Training Area across Marchbanks Dr from the 5th Mob Training Center. Look for the paved area entering the East entrance to the training area. Next to a concrete high line post there is a water faucet (the water is potable if you want to fill your fresh water tank) and a man hole cover. The man hole cover has been modified so that you can lift a lid and insert your waste hose. 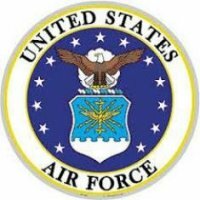 Robins Air Force Base located in Warner Robins GA, FYI. We stayed here to visit with family in the area and it is our old home, so we may be biased. It is located in a beautiful area of the base, not to hard to get in and out of. You are supposed to go in and out thru Gate 4 The commercial gate only. But we didn't know they had moved it and entered thru the Russell Gate and they let us through. There are 6 gates and are open at different times and they change the obstacles often. Call first - early in the morning M-F as they are not open on weekends. They do have people on orders who stay so it's not just travelers. They have a little space for overflow with no h/ups and they have NO DUMP station. We had to dump in the night hosts' site. It's small but a nice place to stay if you are in the area and can get it. Great Museum next door. Not a bad little campground to spend a few days in and rest up. Good location and great price. Must say it was very quiet for my stop over. Make sure if you decide to stop over use "ONLY GATE 4" for incoming and outgoing with your large rigs, travel trailers with any length. All gate security personnel really helpful in this area. Would visit this campground again without question. My ratings are low for this campground. This campground can do so much more to improve. The best thing going for this campground is the camp host. We took some damage to our 5th wheel when we left Albany. After arriving at Robbins, I asked the Camp Host if there was someone local that made site calls. She hooked me up with a great tech. He fixed my unit, and at a cost that is less than I would have paid at a dealership. The camp host even met him at the front gate for me. That is service. The down side to the campground. Looks like a trailer park. To many full timers, and they don't care how their sites look. The laundry room needed to be cleaned. The lock to the laundry room is almost impossible to open. Then need to fix it, they know it is a problem. The office is only open from 1000 - 1400, Mon - Fri. The roads in the campground need to be fixed. There is orange cones in place where the big ruts in the road are. The problem, there is no way to avoid the ruts when you leave. MWR needs to spend some quality time at the park. We tried for HOURS to reach someone by phone to see if there were openings as we drove down from the north on our way to Florida. Glad we persevered as there were several openings and the campground is pleasant. We easily got a satellite signal though I'm not sure all would, Verizon phone was good, and the most sites were adequate for even the largest rigs. Some of the previous reviews talked about homesteaders and there may have been a few, but it is not as bad as some places we've been. Also, although the literature says no reservations except for a limited number of sites, it seems they do take reservations IF you can ever get them on the phone. If there was a host couple as so often mentioned in other reviews, perhaps they take the winter off as we saw no one. We'd stay here again. Wish their phone system worked better. Follow directions from this site, not from the "book."